Sometimes its good to get a quick take out type meal, my in laws have gone to NYC for 2 days, so today was lovely and chilled, then I had a dietetic association meeting in the evening. I am on the board and the webmaster, I bet I never would have thought of this a while back! On the way home I got this from whole foods, very good. Little Jasmine was still up and gobbled up 4 strawberries. mmmm...delicious! When I want fast, I turn to nuts and dried fruit. For me, I'd have to say a cupcake from crumbs bakeshop. Huge cupcakes that fill the tummy. Yum!! I don't know what's my fav. fast food.....too many to name just one. Looks good! Cheese, crackers and fruit or tuna salad wrapped in nori squares are my favorite fast foods to grab when I am in a hurry or don't feel like cooking. Looks like a good fast food and yummy too. if we're in hurry sometimes we have a little (purchased) pate on a baguette. I noticed that Kristin likes Jason's Deli. Many years ago we lived next to the founder of Jason's Deli in Texas. That's a great place and I wish we had one around here. Sam: oh pate where do you get it ? My favorite fast food is Thai hands down. Unfortunately for us, there is not a local Thai restaurant nearby to make a quick pick-up in the evening. Do I dare say that we have had more than our fair share of the Chik-Fil-A drive through window on the way to soccer practice? This looks yummy! My fave is pizza or Chinese! my little space; i didn't make it ! Reeni: oh pizza now ya talking! Perfect! 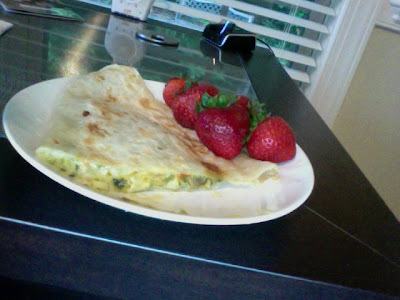 I love a good quesadilla, it always hits the spot! Do you count sandwiches as fast food? Chicken quesadillas are definitely on our favorite fast food list, then sandwiches with whatever we have in the fridge, and omelettes. Salads in the summer and soups in the winter! Boring I know but still I wouldnt say no to that quesadilla!